Director John Ehrlich and his Spectrum Singers exalted the air with trumpets, drums, and a splendid small orchestra in a promising venue new to our eyes and ears. 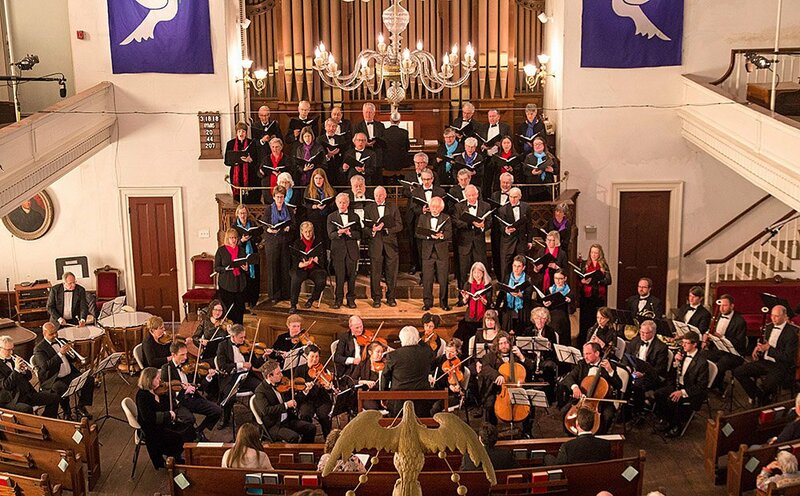 Sunday at Gloucester’s 1806 Universalist Meetinghouse, drawing-room and ecclesiastical works of Schubert and Haydn, scaled from domestic to divine, competed in different weight classes. To the perfectly acceptable if deferential accompaniment of James Barkovic on a small grand which showed some of the fortepiano’s fragility, the chorus warmed up with three Schubert numbers composed for domestic production and consumption, although it must be noted that one of the families involved was the noble and musical Esterhazy. Schubert’s setting of the 23rd Psalm (D.706; available for men’s, women’s, and mixed chorus) made for a fine aperitif. Raindrops falling from the piano inspired the singers to reflective but not shy rapture as the piece served, over its four minutes, to introduce their attractive sound to the space. Even in its unrestored state, the Meeting House provides a marvelously clear yet warm and intimate acoustic, though the chorus needed to be shoehorned into the raised dais and choirloft at the front. The orchestra sat forward of the first row of pews across the room’s nearly 60-ft width. Seating about 600 (including the not officially occupiable curved suspended balcony), the church can serve as an excellent medium concert hall for the North Shore. The nicely filtered sunlight through the sedate windows, along with theatrical lighting, created an affirming environment. The Gloucester Meetinghouse Foundation deserves much gratitude for its work with the congregation on restoration. We prefer hearing Schubert’s Des Tages Weihe from a celebrity quartet of ausgezeichnet Germanophones, as the poignancy and poetry the composer pours out feel altogether direct and personal. Regardless, the Spectrum Singers found their way into the intensity of this schmerz. Whether pain arose from the composer’s intimation of death, as the conductor speculated, can await a fuller discussion, but many now believe that typhoid fever caught Schubert by surprise (consider some of the discussion in the 29 comments following our Paul Lewis review HERE). If the articulation sounded a bit too rounded, the singers’ response to Ehrlich yielded both abrupt dynamic contrasts and fine crescendos and diminuendos. That Schubert apparently composed Gebet, D.815, to a poem by Foqué in a few hours for an Esterhazy family musical isn’t really so amazing, considering that he would complete several songs on his more inspired days, writing them almost as fast as he could sing them. This piece begins, at least with these forces, like a church anthem. A witty modulation occurs before the four soloists introduce themselves with a few bars each. Soprano Kaitlyn Hess stepped out of the ensemble and projected with subdued clarity and personal expression. Thea Lobo next elaborated in a lower register with particular attention to the words. More pious antheming from the chorus heralded the arrival of baritone Sumner Thompson, familiar to many of us for his powerful projection of lyrical line. Tenor Charles Blandy answered ardently, especially in his upper reaches. The chorus came back with well-blended tone, though with again somewhat swallowed plosives. Throughout, Ehrlich showed engagement through big, clear gestures. Then the piano was pushed to the side and an orchestra of 28, plus organ, upped the ante. It reassured us to see so many familiar faces among the personnel whom expert manager-archivist-trumpeter Paul Perfetti booked. Schubert’s Magnificat in C Major began with a glorious tutti which filled the room as if through McIntosh amps. The brilliant trumpets and martial drums anticipated the Haydn Paukenmesse which would follow. Sounding somewhat diminished in the mix, the 1893 Hutchings organ restored by CB Fisk in the 1960s, left its upperwork stops and most profound bass stops unpulled. Yet sounding so glorious and writ so large, the instruments threatened to smother the chorus—that is, until the 38 singers showed off their ample reserves of power and met the challenge. Over 10 glorious minutes, through the agencies of fine Latin enunciation from the choir, a great quartet to which Teresa Wakim added a superlatively produced soprano, and oboe magic from standmates Jennifer Slowik and Jane Harrison, a bighearted, theatrical, even operatic take emanated from all, to which I add a fivefold amen. The performance channeled both geniality and foreboding in good measure, with high-quality from every quarter. The Kyrie began with quiet smiling repose from the orchestra before the timpani’s rolling tutti invited Wakim to lay down the grand, beautiful theme, with which the full forces ran. The contrasting soloists, quartet, and chorus competed joyfully, with every section, soloist, and ensemble contributing winningly. The Gloria danced with the joy of a harvest fest from the composer’s Seasons. Oboe riffs again floated wondrously. Gary DiPena’s timps punched and expounded with visceral excitement and wit. As an interlude, a noble solo cello obbligato from Michael Unterman summoned Thompson’s bass-baritone miracles in the Qui Tollis. The other soloists intoned their agreement, and the choral glorification returned apace. The fugal Credo really let loose before Haydn painted a passionate picture of the Incarnation. The winds robed themselves with splendor and the soloists sequentially evoked wonder. The chorus managed its own transformation from wonder through declamation and jubilation. Everyone was on fire. The Benedictus purified with a heartbeat pulse, and at the end of a long day of singing, the tireless chorus brought its most plangent tones to the Agnus Dei. The drummer’s patapan directed our path toward the Lamb of God. If the ensuing martial Dona Nobis didn’t take away the sins of the world, would any? Had they been listening yesterday, the furiously warring nations could hardly have resisted Haydn’s orders to grant us peace in this most militant of such exhortations.